Nearly three years ago, Anthony Purcell thought he was dying. He dove into the Florida surf and didn't come back up. He couldn't move at all. His neck was broken, his spinal cord injured. He was paralyzed, he learned in the hospital after a cousin pulled him from the water. But "paralyzed" is a word his family refuses to say, and a prognosis the Purcells refuse to accept. "From the minute I walked in that hospital, I knew I was going to get him back on his feet And nobody was going to tell me any different," said Micki Purcell, Anthony's mother. Roger's passion is the violin, but a neurological disorder called essential tremor (ET) makes it nearly impossible to play. 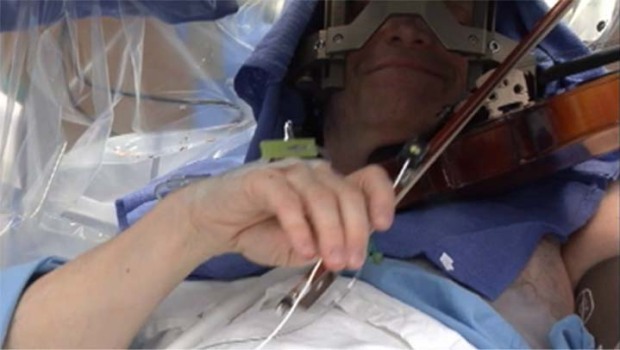 To steady his hands, Roger underwent brain surgery that allowed him to play the violin while doctors fired signals into his brain to target the tremors. Dr. Bruce Hensel reports for the NBC4 News at 5 p.m. on Nov. 23, 2012. Anthony got just 20 days of rehabilitation covered by insurance, then he was cut off. His family can afford to continue further intensive therapy at Project Walk in Carlsbad with their own funds. But they know that few others have that chance. And that disparity – and insurance companies' policy toward rehabilitation of spinal injuries – prompted the creation of nonprofit Walking With Anthony. "Now my mind set is on helping other people," Anthony said. Trauma Survivors Paired With Artists, "Then the Magic Happens"
Laura Sharpe started Artists for Trauma after a helicopter crash landed her in the hospital for nearly two months and forced her to undergo some 30 surgeries in just two years. The program has grown to pair artists with trauma survivors, who learn to achieve again. Patrick Healy reports for the NBC4 News at 11 p.m. on Nov. 9, 2012. On a recent day, Anthony was taking some of his first steps at Project Walk, which he travels to from home in Newport Beach. Strapped into a walker, Anthony's slow progress across the room did not look easy. "I don’t even care how it is. It might not be controlled but still, just putting my left foot forward -- looking down below and seeing that happen is relief and shows hope," Anthony said. He and Micki want others to have that opportunity, so Walking With Anthony gives grants to those with spinal cord injury who are in need. "The medical system has turned their back on spinal cord injury and it’s criminal," said Micki, pictured at right below. "You can’t put a price on helping one person getting stronger and healthier." Erica Predum, a mother from Indiana who was paralyzed from the chest down after a car accident, was one of the first people helped by the Purcells' organization. "Walking with Anthony helped me change my outlook on my recovery," Predum said. "They helped me realize I was capable of doing things I was once told I could never do." She spent five years using an electric wheelchair, but after five weeks of additional therapy, she progressed to using a manual chair. "We're going to help them more independent. We're going to help them get more strength and we're going to help them live a better life," Anthony said. "Anything is possible and that's why we're here to help."